The Q'Mark LBH150G is small and easy to carry for small heating jobs. The unit features open coil elements for quick heat up. 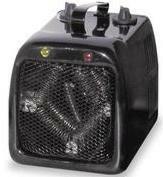 The heater has a maximum output of 1500 watts or 5120 BTU's and a low setting of 1000 watts or 3410 BTU's. Other fetures of this heater are an adjustable Thermostat, safety overload switch, power signal light, top mounted handle and controls and a grounded 6' cord and plug. Our 35090L4002 Ground Fault circuit Interrupter is recommended for use with the utility heater especially in wet environments or garages. The unit is UL listed. The Q'Mark part number is LBH150G.